A well conceived employer brand is a very powerful and persuasive asset to any company. In today’s competitive and increasingly global employment market, where companies need to attract and retain the best talent, their employer brands must work hard to present a distinctive place to work with good career prospects and meaningful brand values. So what is an employer brand? In short, it is the image a company projects as an employer. A strong employer brand not only attracts skilled and motivated people, but it also improves loyalty to their employer by building a connection on an emotional level. And who wouldn’t want the best talent working for them? The best people inspire innovation and build profitability and growth. New employees are no longer just looking for a good salary – they want to know what the work environment is like, how a company’s values fit with their own, what CSR policies are in place and how ethical the business practices are. Very few of the best recruits, particularly the millennial generation, are content with just a steady job – they are more likely to seek new challenges and adventure, and relate to a good work-life balance and interesting job content. Employers need to be genuine, transparent, authentic and creative to be successful with their employer brand. The critical part in building a successful employer brand is to make your company stand out and be visible first – in that respect there is a strong similarity between a customer facing brand and an employer brand. Both aim to create a clear point of difference. Historically, recruitment and employer branding has been a low priority – often, potential employees were left to form their perception of a company as a place to work through contact with traditional messaging and marketing activities. The problem with this approach is that the corporate brand is the only thing influencing the employee’s vision of that company. The social media revolution has changed everything. It is now much easier for employees and ex-employees to share their experiences and opinions and for this information to gain widespread exposure and influence an employer brand. For this reason, it is vital for brands to communicate consistently to their customer and employer audiences. If your employer brand doesn’t reflect what’s really happening in your organisation, this will be exposed quickly through social media channels. Of course your careers website is the gateway to how your employees initially connect with your employer brand. It goes without saying that this shop window needs to be as impressive as anything you do from a corporate perspective. It’s your chance to showcase your employer brand and for your target audience to understand what it’s really like to work there. Video can be a really powerful tool here. And most people today of course are accessing your site on their smartphones, so it’s vital that your site and your videos are optimised for mobile. An employer brand deals with the reality of being employed by a particular company and at its heart is the Employee Value Proposition (EVP). Think of it as the promise a company makes to its staff. The EVP is a strategic statement that defines what a company wants to be associated with as an employer. The EVP also highlights what makes the company different from other employers and encapsulates the value that employees bring and what they can expect in return – what you give vs what you get. With a well-managed employer brand, organisations are able to promote themselves and their values, not just financial reward. Research shows that every company, no matter what size or industry sector, has an employer brand, even if they don’t promote one, so it makes business sense to actively shape and manage it rather than leave it to chance. And with the global economic recovery increasing the competition for talent, employer branding has never been so important to New Zealand and Australian businesses. Talk to Angle about your employer brand – click here. 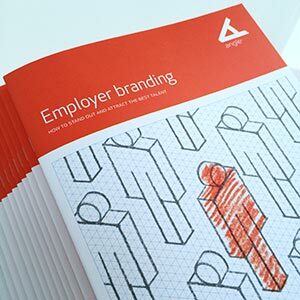 Request a copy of our employer branding document (pictured above) – click here.